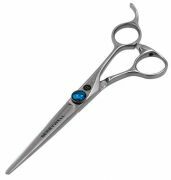 Scissors made from damask steel (032 LAYERS) in futuristic design with classic, semi-offset handle for classic, light and essential cutting. Highly practical thanks to the handle design. Fitted with a second screw for individual style.